A gluten-free, top-8 allergy-free, and vegan yule log? Yes, please. This one features a rich chocolate truffle mousse inside chocolate sponge cake topped with a creamy buttercream. A typical yule log recipe includes a lot of eggs and little fat, lending itself to the texture typical of a jelly roll sponge. Using the right combination of flours, baking powder, a bit of xanthan gum, and just enough oil to make up for the amount in the eggs helps deliver the same result. For a variation, add grated orange zest to the filling, or spread a thin layer of raspberry jam on top of the filling before rolling. I originally developed this recipe for Allergic Living‘s 2014 holiday newsletter. To make the cake, preheat the oven to 375º F. Lightly oil a 15 x 10 x 1-inch jelly-roll pan (a baking sheet with sides). Line the bottom with parchment paper. Grease the paper with coconut oil. Dust a clean dishtowel with icing sugar, laying it out flat (you will invert the hot cake onto the dishtowel immediately after baking, so you want to have this ready. Put the sorghum flour, quinoa flour, arrowroot flour, cocoa powder, baking powder, xanthan gum, and salt in a medium bowl. Whisk well to combine. Put the nondairy milk, ground flaxseed, and oil in a small saucepan over medium heat. Once the mixture starts to steam and the oil is melted, whisk well to combine. Pour the mixture into the bowl of a stand mixer. Add the sugar and vanilla to the nondairy milk mixture. Beat on high for about 2 minutes, until well combined. Turn the speed of the mixer to low. Add the flour mixture, beating until just mixed, scraping down the sides of the bowl with a spatula. Turn off the mixer and stir in the vinegar. Spread the batter onto the prepared pan, leaving a border of about 1-inch from the sides. Bake for 9 to 12 minutes, until firm to the touch and a toothpick inserted in the cake comes out clean. Carefully invert the cake onto the dishtowel. Peel the parchment off of the top of the cake. Starting at one of the long sides, and using the towel as an aid, gently roll the cake jelly-roll style (you will be rolling the towel inside of it). Cool completely in the towel. As the cake cools, make the filling. Put the coconut milk in a small saucepan over medium heat. Place the chocolate chips in a heat-safe bowl. Once the coconut milk is steaming (but not boiling), pour it immediately over the chocolate chips. Let stand 10 minutes, then stir until the chocolate chips are completely melted. Refrigerate for about 1 hour until cool (it should be like pudding). Transfer the mixture to the stand mixer and whip on high for about 1 minute until the texture of mousse. Put the mixture back into the refrigerator. Once the cake is cool, remove the filling from the refrigerator and unroll the cake, removing the towel. Spread the filling evenly over the cake to about 1-inch from the edge. Reroll the cake to form a log. Place the cake, seam side down, on a serving platter. Refrigerate while making the frosting. To make the frosting, put the buttery spread in the stand mixer. Beat on medium-high for about 3 minutes, until fluffy and smooth. Turn the mixer to low speed. Add the cocoa powder, vanilla extract, and 2 tablespoons of the non-dairy milk. Beat until well combined. Add 1 cup of the confectioners’ sugar. Beat until smooth. Alternately add the remaining confectioners’ sugar and non-dairy milk until the mixture is smooth. Turn to high speed and beat for 4 to 5 minutes, until creamy and fluffy. Remove the cake from the refrigerator. To make a branch coming out of the side of the log, cut a 4-inch diagonal slice off one end of the cake, placing the cut side of the piece on the side of the remaining cake. Spread the frosting over the whole cake. Use the tines of a fork to create a rustic “bark” effect in the frosting. Dust with icing sugar for “snow”. Serve at room temperature. 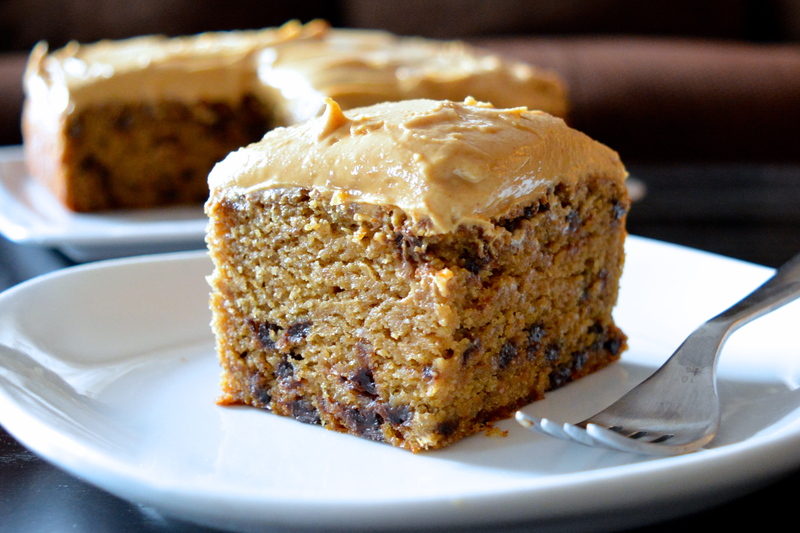 The peanut butter frosting is what makes this cake perfect for dessert, but if it’s breakfast you’re after, nix the topping and swap the chocolate chips for toasted walnuts in this incredibly moist and not-too-sweet anytime treat. This recipe was developed for Cuisine Soleil, a Canadian-based gluten-free and certified organic flour company that produces over 12 flours and a variety of mixes. The buckwheat flakes in this recipe add just the right amount of texture and tenderness without creating density or heaviness. Preheat the oven to 350 degrees F. Lightly oil the bottom of an 8-inch square baking pan. Line the bottom with parchment paper. Put the sorghum flour, buckwheat flakes, millet flour, tapioca starch, baking powder, xanthan gum, baking soda, and salt in a medium bowl. Whisk well to combine. Put the nondairy milk in a measuring cup. Add the cider vinegar and let stand for about 3 minutes until clumpy. Put the unrefined cane sugar and coconut oil in a large bowl or the bowl of a mixer. Using the stand mixer or a hand mixer, beat until well combined. Add the bananas and vanilla extract. Beat until well mixed. Turn the mixer on low speed. Add half of the flour mixture. Beat to combine. Add half of the nondairy milk mixture. Beat to combine. Repeat with the remaining flour, then the remaining nondairy milk, until mixed. Turn off the mixer and stir in the chocolate chips. Scrape the mixture into the prepared pan. Bake for 40 to 50 minutes, until a toothpick inserted in the centre of the cake comes out clean. The cake will begin to pull away from the sides of a pan and spring back when lightly touched. Let cool for 10 minutes in the pan, then invert onto a rack to cool completely. To make the frosting, put the peanut butter, vegan buttery spread, and vanilla extract in a large bowl or the bowl of a mixer. Using the hand mixer or stand mixer, beat until creamy and well combined. Add the icing sugar and beat on medium until mixed, then turn the mixer to high speed and beat for about 2 minutes, until light and fluffy. Spread generously on the cooled cake. Note: If you don’t want the taste of coconut from the coconut oil, look for organic varieties that aren’t virgin—they have the same nutritional content without the strong flavor.